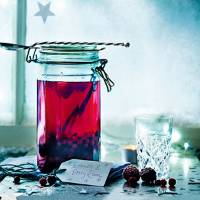 This rum-based take on sloe gin is perfect for cold-weather walks – or try adding a snifter to mulled wine for an extra-fruity kick. Mix all the ingredients together and pour into a large Kilner jar or wide-necked bottle. Seal and leave to infuse for 7-10 days. Strain and decant into a pretty bottle or smaller presentation bottles. This recipe was first published in Thu Nov 05 12:40:12 GMT 2015.